Gotta give it to some songs. They know what they're about. This song knows what it's about. This song should teach a class to other songs about knowing what they're about. And this song is about Booty City. A place you gotta see for yourself. Clocking in at way less than three minutes, "Booty City" still manages to pack it in. 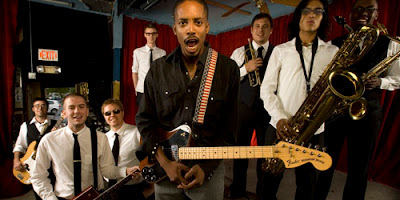 With the same relentless spirit that Ainsley talked about way back when, Black Joe Lewis & The Honeybears pack as much energy as they can into the song's 160 seconds, and everyone (Joe Lewis, the singing band) and everything (the guitar riffs, the funky bass) seem excited about this mythical Booty City. While not a particularly deep song, it knows what it is, and it does that well. So next time you're headed to your Shangri-La, your El Dorado, your Booty City, put this song on and let Black Joe Lewis and his Honeybears ride with ya.